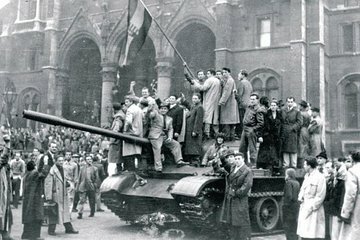 En 1956, Budapest presidió la sublevación húngara, una revolución contra el régimen soviético que fue rápidamente aplastada. Con esta visita privada, visite los sitios y escuche acerca de la rebelión en una profundidad difícil de replicar si viaja solo. Echa un vistazo a las plazas y los distritos donde se realizaron las protestas, y escucha testimonios que capturan los eventos y la represión soviética con una intensidad que no experimentarías de manera independiente. Refrescos y recogida en el hotel están incluidos. Visite los sitios clave involucrados en la revuelta con una guía para dar vida a los eventos. Aprende hechos y testimonios personales de la época en que no puedes escuchar lo contrario. Wonderful time and very educational. Tour guide was very polite professional and Knowledgeable. Spent time explaining key areas and events in Hungarian History. However, The tour was too general, with not enough time or information devoted to the 1956 Revolution. the reason why we had booked this tour. we had studied the Revolution before and a lot of key areas where missed, even though we walked past them. With that, we did learn about other areas of Hungarian History and visited places we had not been Before. The tour guide did admit that this was the first time he had taken this tour. The tour takes you to the important sites of the revolution. My guide was able to answer all my questions and provide valuable information of each location and its relevance to the revolution. I definitely recommend it to anyone interested in Hungarian history. This was an excellent tour by our knowledegable guide, Miklos who lived through the Communist era and was able to give personal insight into the times. We enjoyed the mix of walking and tram rides around the city and particularly the underground memorial to the 1956 Revolution. My partner and I have travelled extensively around Europe in the last 4 years and this was one of the best tours we've done. Thank you Miklos!